Add cheese to a patty about 1 or 2 minutes after you flip it. The volume of fat in ground beef is one of the most significant factors in a juicy burger, even though you may rarely notice it. Burgers are unavoidably dry if the meat doesn’t contain enough fat. Gently shaping moderately thick patties and handling them as little as possible affects the volume of fat and the moisture that burgers lose while they cook. “Ground beef” is a generic term for any ground cut of beef, such as chuck or sirloin. It can contain up to 30 percent fat and come from one cut of meat or a mixture of cuts. Choose ground beef that contains about 15 to 20 percent fat -- enough to keep the meat juicy but not enough to make it greasy. Ground round has very little fat -- about 11 percent. It’s best to avoid it if you want moist hamburgers. Ground sirloin is tender but may be a little lean to yield juicy burgers -- it’s around 15 percent fat. Ground chuck is 20 percent fat; it’s less tender than sirloin but more flavorful. Chuck yields reliably juicy burgers as long as you handle it properly and don’t overcook it. Incorporating liquid into the meat before you shape the patties gives you a slight moisture cushion, further protecting the meat from intense heat or overcooking. Add 2 to 3 tablespoons of ice-cold water per pound of beef, or substitute a flavorful liquid such as beef stock or Worcestershire sauce if you prefer. Salt is a vital to enhance the beef’s flavor, but it also draws moisture out of meat if you apply it too far ahead of cooking. Wait to sprinkle a generous pinch of salt on each side of a patty immediately before you place it on the grill, griddle or skillet to prevent it from causing moisture loss. Add other seasonings such as ground pepper to taste before you shape the patties or when you add the salt, depending on your preference. Handle the meat as gently and minimally as you can to avoid making the patties dense, which will require you to cook them longer. Form loose balls of meat approximately the size of tennis balls. Flatten each patty until it is about 3/4- to 1-inch thick. Thin burgers dry out quickly. Press your thumb into the middle of the patties to make dimples that are about 1/4-inch deep. The edges of hamburgers cook and lose moisture more quickly than the centers, causing patties to bulge and look spherical. The dents should minimize bulging. Create a two-zone grilling environment in a charcoal or propane grill. Heat the grill on high heat for 15 minutes. Brush the grate with a grill brush; then apply a light coat of cooking oil to prevent sticking. Place the patties on the direct heat side of the grill. Heat a countertop grill, a griddle or a skillet on medium-high for 15 minutes. Apply a light coat of oil or butter if the grill, griddle or skillet does not have a non-stick coating. Place the patties on the preheated surface. 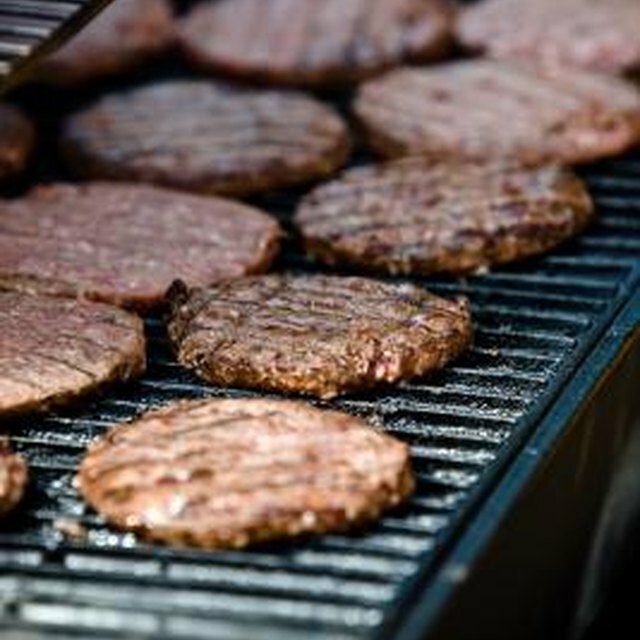 Avoid touching the patties with a spatula unless absolutely necessary; contact encourages juices to flow out of the meat. Never press, squish or flatten the meat with your spatula; that forces moisture out of patties. 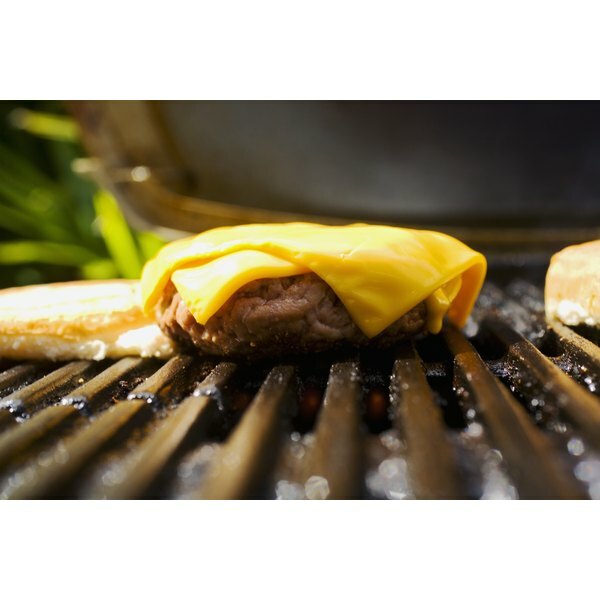 The undersides of the burgers should develop seasoned crusts, which are flavorful and prevent moisture loss. Flip the burgers only when juices from the meat start to bead on the tops of the patties, after about 4 to 7 minutes. Do not flip the burgers again. Cook the burgers until they have internal temperatures of 160 degrees Fahrenheit according to a meat thermometer. Meat must cook to 145 F to be safe to eat, but you should cook ground meat to 160 F to ensure it all reached 145 F, according to the U.S. Department of Agriculture. Burgers that are 160 F are well-done and should feel firm to the touch. Medium-well burgers would only be about 145 to 150 F, but they would be juicier than well-done patties. Transfer the patties to the indirect heat side of an outdoor grill or reduce the heat of an indoor grill, griddle or skillet to medium-low if they are sufficiently brown but have not achieved the desired internal temperature. Rest burgers for about 5 minutes after removing them from the heat to assist juice retention.